Please direct questions about SGF Programs to Quincy Heard. Quincy can be reached by phone at 360-836-7711, or email at quincy@summitgolf.org. Thank you! 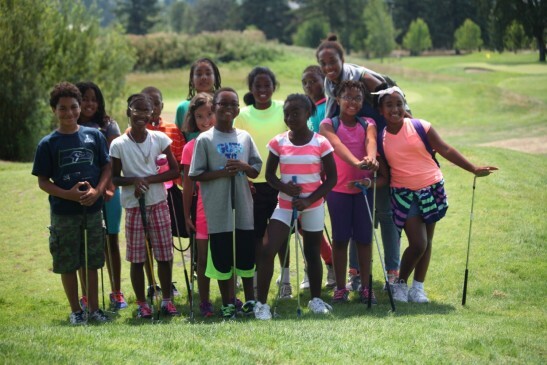 During outreach clinics, we partner with other organizations and provide unique, specific golf training for the youth they work with. Currently, we provide outreach clinics to My Father's House and are seeking new additional partnerships in our community. My Father's House is a family shelter in Gresham, Oregon. Families struggling to find safe, stable housing are welcome to stay for up to 3 months. During their stay, parents meet with social workers, attend AA or rehabilitation classes if necessary, and are required to take courses such as personal finance and resume building. SGF partnered with My Father's House to provide bi-weekly classes, Monday -Friday at Glendoveer Golf and Tennis. SGF’s Caddie Program is a great way for youth ages 14-18 to spend their summer. Caddies are offered the opportunity to get loops 3 days a week at Glendoveer Golf Course (Saturday, Sunday, and Tuesday). Training is provided to students on a monthly basis. Students learn how to be the best caddie they can by learning the three E’s of an admired caddie (Equipment, Etiquette, and Evaluation). Caddies earn daily stipends based on the number of loops, keeping the cost free to the player. 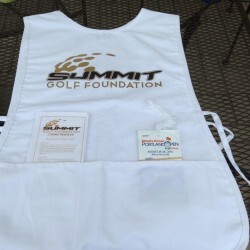 Caddies are provided equipment and refreshments by SGF. 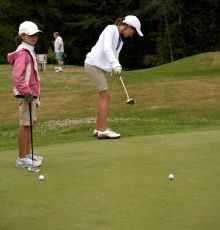 The Caddie Program seeks to provide outstanding caddies to golfers at Glendoveer Golf Course. Our caddies come from a variety of social backgrounds and are looking to better their lives by pursuing an Evans Scholarship. The Evans Scholarship is a four year full tuition and housing college scholarship available for caddies. Over 900 deserving caddies receive this scholarship each year. Our caddies strive to provide you with the best golfing experience and also improve their lives. Hiring an SGF caddie provides an opportunity for a young person in your community to take a step closer to achieving their dreams.